As companies grow it is important that their IT infrastructure mature with them. with respect to Small Business IT Professionals, of which I know many and for whom I have great respect, there are several challenges that IT departments must address as they mature beyond Small Business Server with regard to planning, architecture, hardware, and software. The tools that single-server IT shops use to manage and monitor what they have usually do not scale well, and it is important for the IT Pros planning the growth to be familiar not only with what tools are out there and how to install them, but how they will monitor and manage those systems as they grow. SWMI Consulting Group started out as one person – me – with a laptop and an old used SBS box. With time I grew into we, and we have acquired a lot of equipment from different sources and even different eras. (See “The shoemaker’s son always goes barefoot…”about my 10baseT Ethernet Hub.) Honestly for a very long time, despite having a lot of great equipment, I had not taken the time to plan, design, and build the infrastructure properly. I have known for a very long time that I needed to put the structure back into infrastructure but I never had the time to do so. 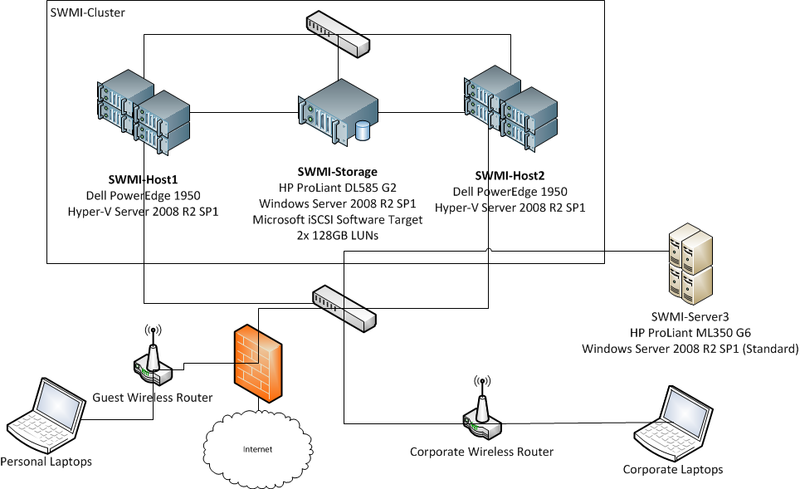 A couple of years ago, right after the demise of Essential Business Server, I decided that I could have a proper enterprise server environment set up for SWMI Consulting Group. The fact that I had a single server wasn’t going to stop me… Cam and Steve came over one Sunday and over beers we planned out the environment, and the virtual machine configuration. Of course Hyper-V did not have Dynamic Memory yet, so we had to plan out the 16GB very carefully. We built up our virtual machines – One for SQL Server, two for System Center Operations Manager, one for System Center Configuration Manager, one for System Center Virtual Machine Manager. I already had a domain to work with, but frankly that would not have been the time-consuming part of this. We had all of the components installed after about 12 hours… and although I did spend some time configuring it over the next week, it was a lot of work for one guy, and it was certainly beyond overkill. The bottom line is that no small organization needs those tools, and frankly nearly none of them will ever have the resources to implement, manage, and maintain them. In the intervening years, SWMI Consulting Group has grown. We have grown in manpower, the size, type, and scope of contracts that we take, and we have certainly worked hard to build a reputation as a boutique consulting and training firm with a solid work ethic. We have fostered relationships with several firms that trust us to develop and deliver training when it has to be done right. Of course, with this we have also acquired a number of servers that we use not only for our internal infrastructure, but also for demos and courseware development. Most of our server installations have been transient – this week they run ESX, next week Hyper-V, and so on. It is the nature of what we do… or how we did things. I have known for a very long time that I needed to clean up the infrastructure… it was simply a question of finding the time to do it. Last week I noticed that I had ten days before my next trip, and I made the decision to do it. One of the issues that I faced – and one that I know is not uncommon to growing firms – is how to build the infrastructure that they need out of the parts that they have, without having to spend a fortune on new hardware. While it is nice to be able to show off a server room where everything is uniform – same brands, same size, same form-factor – our needs change as we grow, and achieving that beautiful pristine server room may require spending a lot of money on new hardware, while discarding perfectly good hardware that cost good money and would probably achieve a lot of the same goals. For SWMI we decided that functionality would win over looks (note my wardrobe) for several reasons, not the least of which is that nobody ever sees our physical server room, even though thousands see the servers – I run demos on them for audiences all the time. We knew that if we designed our secure, well-managed infrastructure properly, it would not matter that it was built on (to quote a colleague) Frankenstein Hardware. In the end we saved tens of thousands of dollars, and still achieved our goal of building an IT infrastructure that was not only functional, but that lived up to our corporate name and motto. I have said time and again that proper planning is the difference between success and failure, and using the right tool for the job is the only path to success. I may have the knowledge to implement an enterprise configuration for the company, but I do not have the time to maintain and monitor it. Frankly, I really don’t have the need either. System Center Essentials is Microsoft’s mid-market solution for these enterprise needs; it was once the foundation for Essential Business Server 2008, but even before that it was and continues to be a viable stand-alone product in its own right. The System Center team took those enterprise level packages – OpsMgr, ConfigMgr, and Virtual Machine Manager – and used them to create Essentials. It has most of the same functionality of the enterprise products, but is packaged, licensed, and priced for small- to mid-sized businesses. It offers so much more by way of management and monitoring tools than you would find in Small Business Server; in other words, it is perfect for SWMI Consulting Group! It is important to note that even though my SCE install is HP-branded – HP Insight with Microsoft System Center Essentials – it is fully capable of managing and monitoring non-HP servers. I have two older Dell servers in my datacentre, and my HP Insight with SCE will manage them just fine – I just have to make sure I have the appropriate server management licenses (SMLs), and download the appropriate Management Packs for the hardware. Even though SWMI is a small business, it took some planning to design and then build the physical architecture. Visitors and contractors with untrusted laptops should be able to connect to the Internet, but not to the corporate network. I decided to plan two wireless networks to do this, one for SWMI and one for guests. I have a lot of server hardware, most of it is pretty functional. My first server – the ProLiant DL585, is a great Hyper-V host and has plenty of hard drive space, but because it is the only AMD Opteron based server in the group, it would not be compatible for Live Migration. It is not currently in the budget to buy a SAN device… but because Microsoft released its Microsoft iSCSI Software Target 3.3 for download earlier in the year, I decided that the DL585 would make an excellent Software SAN. Because I know that Microsoft does not recommend or support implementing System Center Essentials as a Highly Available Virtual Machine, I decided to make my SCE VM a guest on this machine. **I had to run some tests to make sure this would work. I am using the OEM product HP Insight with Microsoft System Center Essentials 2010, which is BIOS-locked to HP servers. Because it can only be sold with a new HP ProLiant server, I needed to ensure that the older G2 BIOS would be compatible. After running the BIOS-Injection tool on the host OS, the installation worked just fine. Last year I purchased two used PowerEdge 1950 servers. They are identical, Intel-based 1U servers. They currently only have 1CPU and 4GB of RAM each… not nearly enough for my needs, but I decided to implement them as part of my solution in the meantime, and will buy CPUs and RAM in the near future. Speaking of things I needed to buy: as you may have read in my recent article (The shoemaker’s son always goes barefoot…) my network was being run on a single hub that was an entry-level hub that was likely 12 years old… not quite what you want for performance and reliability. I went out and picked up a pair of NetGear Gigabit switches from Tiger Direct. I would much prefer Cisco, but we do what we can on a budget! My wireless routers are both reasonably decent – D-Link Wireless N, so I would not have to spend any money on those. My main server is an HP ProLiant ML350 G6. It is a powerhouse and I love it, but for reasons I won’t go into it currently runs Windows Server Standard Edition, which means that Failover Clustering is not an option. Later in the project – likely this afternoon – I will be exporting the myriad virtual machines that are currently running on it, and make the critical ones HAVMs on the Failover Cluster. Once I have done that I can reformat the server with Enterprise Edition, and as soon as SCE detects it I will make it a host, and join it to the Failover Cluster. Although the three clustered virtualization host servers in my environment are all Intel-based, there may be some incompatibility with regard to Live Migration because some are older than others. I will mitigate that for my virtual machines by clicking the checkbox in the Processor Settings that says Migrate to a physical computer with a different processor version. This is essentially the same as Enhanced vMotion Compatibility (EVC) in VMware, but is much more flexible because rather than being configured per cluster, it is configured on the virtual machine itself. Of course this will change somewhat when I reformat the ML-350 and join it to the cluster, but this is essentially what it looks like now. The virtual environment is not quite done – all of the original VMs that I had are still running on the ML-350, but that will start to change today as well. My System Center Essentials server is the exception of course, it is a non-clustered guest on the DL-585. It will stay there, although it will be backed up onto the cluster. I will also probably build a second DC on that server – it has 16GB of RAM so I can afford to build a few VMs there that do not need to be clustered – maybe a VDI client or four. The good thing about building a secure, well-managed infrastructure based on Microsoft virtualization technology is that I have a lot of options, and can take my infrastructure in any way that I like!